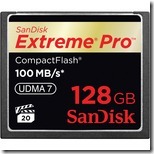 Sandisk is now shipping the ultra-fast, ultra-high capacity 128GB 100 MB/s (about 600x)—that’s not a typo, it’s really 128 Gigabytes, bigger than many laptop hard drives were just a couple years ago. You can get it from B&H for $1199. If that is too rich for your blood then our new favorite value champion is the Transcend 16GB 600x CompactFlash Extreme Plus UDMA Card—available from B&H for $79.95. We have one and it benchmarks faster than our 400x cards and is only $20 more. A small price to pay if it gets you the final shot in an amazing action sequence.